Christie’s New York will offer Claude Monet’s Nymphéas, a 1905 view of the Lily Pond at Giverny from the iconic series that was the crowning achievement of the artist's career. Estimated at US $30-50 million, the painting will be offered at the Impressionist and Modern Art Evening Sale on November 7th 2012 at Christie's New York, Rockefeller Plaza. Although the garden was a favored subject for many of the Impressionists, including Manet, Renoir, and Caillebotte, no artist rivaled Monet in his dedication to the theme. Robert Herbert has written, "Of all the Impressionists it was Monet who was chiefly responsible for elevating the garden to the ranks of the most admired and influential paintings of the early modern era" (Impressionism: Art, Leisure, and Parisian Society, New Haven, 1988, p. 259), and Monet himself once told a journalist, "I perhaps owe it to flowers for having become a painter" (quoted in P. Tucker, Claude Monet, Life and Art, New Haven, 1995, p. 178). The artist especially liked to paint his own gardens, first at Argenteuil, then at Vétheuil, and finally at Giverny, where the garden became his preeminent subject. During the last two decades of his life, Monet devoted himself almost single-mindedly to depicting the water garden that he had fashioned at Giverny, producing an astonishingly complex series of more than two hundred canvases that constitute some of the most novel and influential works of his entire oeuvre. Paul Tucker has written about these paintings, "They stand as eloquent witness to an aging artist's irrepressible urge to express his feelings in front of nature and also attest to his persistent desire to reinvent the look of landscape art and to leave a legacy of significance" (Monet in the Twentieth Century, exh. cat., Museum of Fine Arts, Boston, 1998, p. 14). The present canvas dates to a particularly creative and productive period of work on the water-lily paintings (1905-1908) and forms part of a subset of canvases that Tucker has called "the most classic of all the views" (ibid., p. 148). It was featured in the inaugural exhibition of the series at the Galerie Durand-Ruel in 1909, which established Monet beyond any doubt as the most innovative landscape painter of the day: "Monet has reached the final degree of abstraction and imagination allied to the real that his art of the landscapist allows," the critic for Le Siècle declared (quoted in ibid., p. 50). Monet and his family moved to Giverny in April 1883. Situated at the confluence of the Seine and the Epte about forty miles northwest of Paris, Giverny at the time was a quiet, picturesque farming community of just 279 residents. Upon his arrival there, Monet rented a large, pink stucco house on two acres of land. When the property came up for sale in 1890, Monet purchased it at the asking price of 22,000 francs, "certain of never finding a better situation or more beautiful countryside," as he wrote to Durand-Ruel (quoted in P. Tucker, op. cit., 1995, p. 175). He immediately set to work tearing up the existing kitchen garden and planting lush flower beds on the gentle slope in front of the house. Monet had been an enthusiastic gardener all his life, and at Giverny he finally enjoyed the means to fulfill this passion completely. He employed as many as six gardeners, consulted with friends like Caillebotte and Octave Mirbeau who shared his love of gardening, subscribed to horticultural magazines and encyclopedias, imported rare plants and seeds from around the world, and even received the advice of a Japanese gardener who traveled to Giverny in 1891 at Monet's request. To a visitor to Giverny, Monet proclaimed, "Everything I have earned has gone into these gardens... I do not deny that I am proud of [them]". In 1910, when the Epte flooded the gardens and threatened their ruin, Monet's grief was so profound that his wife Alice confided to her daughter, "[He] does not speak, but moans... [his] despair, like the Epte, will not abate". Early in 1893, three years after commencing work on the flower garden, Monet acquired an adjacent plot of land between the railroad tracks and the river Ru. Immediately thereafter, he applied to the local government for permission "to install a prise d'eau to provide enough water to refresh the pond that I am going to dig for the purpose of cultivating aquatic plants" (quoted in ibid., p. 176). By autumn, he had converted nearly one thousand square meters into a lavish lily pond, spanned by a wooden footbridge and ringed by an artful arrangement of flowers, trees, and bushes (figs. 1-4). Silent, mysterious, and contemplative, the water garden formed an apt contrast to the more traditional flower garden near the house, with its bold profusion of brilliantly colored blossoms laid out in rectilinear beds. Although Monet created the lily pond in part to fulfill his passion for gardening, he also intended it as a source of artistic inspiration. In his petition to the Préfet de l'Eure for clearance to build the pond, Monet specified that it would serve "for the pleasure of the eyes and also for the purpose of having subjects to paint" (quoted in Claude Monet: Late Work, exh. cat., Gagosian Gallery, New York, 2010, p. 23). And this it did, quickly surpassing the flower garden in Monet's hierarchy of subjects. Tucker has written, "That Monet would have preferred the water garden over the flower garden is understandable. It offered him the ultimate in variety: an infinite array of color; constantly changing reflections; continual tensions between surface and depth, near and far, stability and the unknown, with everything bathed in an endlessly shifting but ever-present light. Filled with feeling yet distinctly physical, it remained mysterious and deeply contemplative, much like the cosmos as a whole". Monet did not begin work on his water-lily series immediately, however. He later recalled, "It took me some time to understand my water lilies. A landscape takes more than a day to get under your skin. And then all at once, I had the revelation--how wonderful my pond was--and reached for my palette. I've hardly had any other subject since that moment" (quoted in Claude Monet, exh. cat., Osterreichische Galerie, Vienna, 1996, p. 146). Between 1893 and 1899, he made only ten images of the lily pond, possibly because he was waiting for the plantings to mature. He may also have wanted to cement his national stature by concentrating on subjects that were more distinctly French (Rouen Cathedral, the Norman coast, the Seine) before turning to his own horticultural fantasia. In 1899-1900, he painted a sequence of eighteen views of the water garden, but these focus on the Japanese bridge that spans the pond, lending the composition a stable geometric structure and traditional linear perspective (Wildenstein, nos. 1509-1520; fig. 5). It was not until 1904, following the enormously successful exhibition of his paintings from London, that Monet began to treat the surface of the pond itself as a motif, and this would remain almost his exclusive subject for the duration of his career. At first, he still opted to anchor the viewer in space by including a narrow strip of the far bank at the very upper margin of the canvas (fig. 6). Soon, however, he eliminated even this last spatial indicator, yielding a dazzling and radically destabilized vision of shifting surfaces and disintegrating forms. The world beyond the surface of the pond now exists only as the most ephemeral reflections. Having established the basic compositional scheme for his water-lily series, Monet began to work feverishly, completing more than sixty views of the pond between 1905 and 1908, or about one every three weeks. The present painting dates to the beginning of this enormously fertile period. He repeatedly postponed the opening of the Nymphéas exhibition at Durand-Ruel, "full of fire and confidence" (as he told the frustrated dealer) and determined to keep working (quoted in P. Tucker, op. cit., 1998, p. 47). Within the limitations that he had set for himself, Monet devised a dazzling array of variations, altering the arrangement of the blossoms, increasing or reducing the amount of reflected material, and exploring a wide range of lighting effects. The present painting, for example, is part of an important subset of canvases from 1905-1907, which are characterized by large, horizontally striated islands of lilies, juxtaposed with undulating, vertical reflections of trees and sky (Wildenstein, nos. 1671-1702; fig. 7). Conventional spatial recession, indicated by the diminishing scale of the blossoms and lily pads, is played against the flat surface of the canvas, which is emphasized by vigorous, textural brushwork. 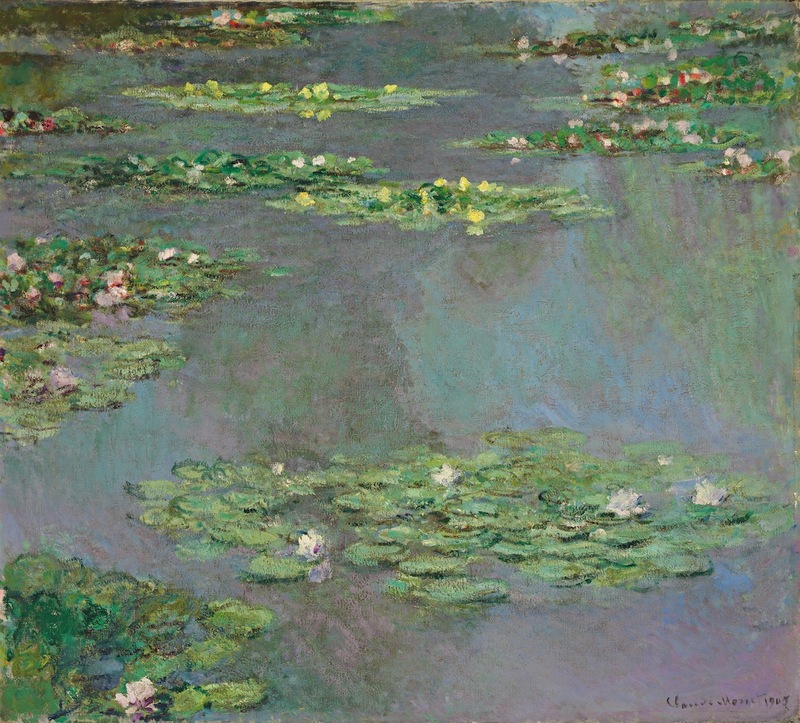 The flowers themselves are rendered with the most impasto to give them a sculptural presence, affirming their position on the top of the pond, while in the watery areas, thin layers of color are laid one on top of another to suggest the refractions of light and the changing hues in the pond's depths. The paintings from 1907-1908, in contrast, largely focus on the effect of a central stream of light that slices through floating clusters of lilies and dense eddies of reflected foliage (Wildenstein, nos. 1703-1735; fig. 8). Tucker has written, "What is clear about all these paintings is Monet's utter resistance to duplication or to predictable results". When the Nymphéas show finally opened at Durand-Ruel's gallery in May 1909, it was an unqualified success. Forty-eight views of the lily pond--including the present painting--were featured, more than Monet had ever exhibited from a single series. The critical response was overwhelmingly positive. The Paris correspondent for Burlington Magazine, for instance, proclaimed, "One has never seen anything like it. These studies of water lilies and still water in every possible effect of light and at every hour of the day are beautiful to a degree which one can hardly express without seeming to exaggerate... There is no other living artist who could have given us these marvelous effects of light and shadow, this glorious feast of color" (quoted in P. Tucker, op. cit., 1995, p. 196). Another critic went so far as to declare that the series ranked alongside Michelangelo's Sistine Chapel and Beethoven's last quartets. By the end of the year, nineteen of the forty-eight paintings had been sold either to Durand-Ruel or to his rivals, the Bernheim-Jeune brothers, netting Monet an extraordinary total of 272,000 francs. Durand-Ruel purchased the present example within weeks of the exhibition's opening and sold it the following year to Charles B. Alexander, a prominent New York lawyer and financier, and his wife Harriet Crocker, daughter of the railroad magnate Charles Crocker. Following the close of the exhibition in June 1909, there followed a period of nearly five years in which Monet--exhausted from the intense months of work leading up to the show, and then suffering from a sequence of personal tragedies--barely took up his brushes. It was not until the spring of 1914 that he returned to his beloved water garden in earnest; in late June, he reported to Durand-Ruel, "I have thrown myself back into work, and when I do that, I do it seriously, so much so that I am getting up at four a.m. and am grinding away all day long (quoted in ibid., p. 204). Although Monet completed well over a hundred paintings of the lily pond over the course of the next twelve years, he opted neither to exhibit nor to sell them, and the majority remained in his studio at the time of his death in December 1926. The culmination of the series and the most ambitious undertaking of the artist's entire career was the Grandes Décorations, an ensemble of twenty-two mural-sized canvases totaling more than ninety meters in length, which Monet completed just months before his death and donated to the French state. The Musée de l'Orangerie, newly remodeled to house the magnificent bequest, opened in May 1927--eighteen years almost to the day since the results of Monet's remarkable achievement in his water garden had last been seen publicly at the Galerie Durand-Ruel.